M. T. Anderson is on the faculty of Vermont College’s MFA Program in Writing for Children. He is the author of the novels THIRSTY and BURGER WUSS and the picture-book biography HANDEL, WHO KNEW WHAT HE LIKED. He says of FEED, "To write this novel, I read a huge number of magazines like SEVENTEEN, MAXIM, and STUFF. I eavesdropped on conversations in malls, especially when people were shouting into cell phones. Where else could you get lines like, ‘Dude, I think the truffle is totally undervalued’?" Subversive, vigorously conceived, painfully situated at the juncture where funny crosses into tragic, FEED demonstrates that young-adult novels are alive and well and able to deliver a jolt. "Another book that can be added to the list entitled 'YA Novels I'd Never Heard of But Which Turn Out to Be Modern Classics' and Feed may well turn out to be the best of the lot . . . Funny, serious, sad, superbly realized." M.T. Anderson has created the perfect device for an ingenious satire of corporate America and our present-day value system...Like those in a funhouse mirror, the reflections the novel shows us may be ugly and distorted, but they are undeniably ourselves. The crystalline realization of this wildly dystopic future carries in it obvious and enormous implications for today's readers — satire at its finest. This satire offers a thought-provoking and scathing indictment that may prod readers to examine the more sinister possibilities of corporate-and media-dominated culture. A gripping, intriguing, and unique cautionary novel. Many teens will feel a haunting familiarity about this future universe. 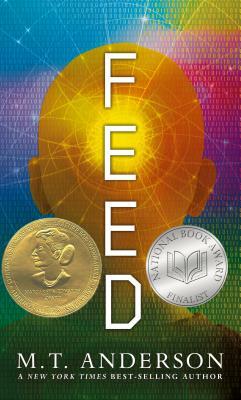 In spite of its foreboding overtones, FEED is in a sense an optimistic novel. By involving its readers in the act it suggests is central to society's survival, the book offers hope. Although set in the future, Anderson's novel is a stunning indictment of contemporary America and its ever-increasing obsession with consumerism even in the face of impending environmental collapse . . . the novel is both intense and grim. It should, however, appeal strongly to mature and thoughtful readers who care about the future of their world. Disturbing yet wickedly funny, with as brilliant a use of decayed language as Russell Hoban's post-apocalyptic RIDDLEY WALKER. This dystopic vision is dark but quite believable. Sad and strong and scary. The book is fast, shrewd, slang-filled and surprisingly engaging. This wickedly funny and thought-provoking novel is written in a slang so hip it is spoken only by the characters in this book. Teens will want to read it at least twice. A darkly comic satire that can be read as a promise or a warning. The flashes of humor as well as the cleverly imagined grim future world should quickly draw readers into this look at teenage love and loss, and at consumerism carried to its logical extreme. The scariest part of FEED's brilliantly conceived futuristic dystopia is that much of it isn't futuristic . . . To list all the prescient details in this novel would require taking something from nearly every page. Frightening in its realistic depiction of what is possible in a culture addicted to information, this novel is a guaranteed conversation-starter. It's exhilarating to decipher Anderson's futuristic adolescent slang, but his story is a serious one. He has an uncanny gift for depicting how teenagers see the world. This language sets a perfect tone for the story of a teenage boy growing up in a frighteningly futuristic world . . . The scariest thing of all is its unnerving plausibility. Surely one of the most prescient novels of last 20 years. As with the best futuristic fiction, it's scary how little needs to be exaggerated. The novel is chilling in the way only a well crafted and darkly writ satire can be.